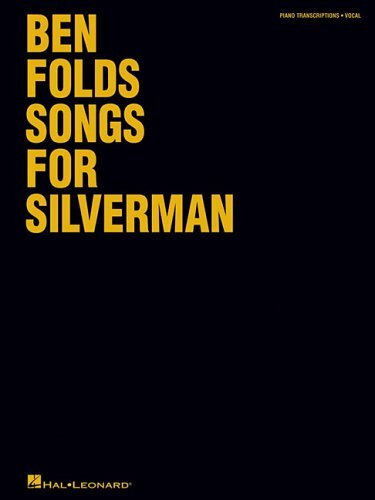 Hal Leonard, the people behind all of Ben Folds (Five)'s official songbooks, will be releasing their 'Songs for Silverman' score "by the end of the month". Already appearing on amazon.com - other retailers to follow after launch - the transcriptions will presumably differ from the musicnotes.com transcriptions that have been available for some time now. Of course, the question we're all waiting to have answered is whether it'll feature just the piano part (like the slightly disappointing 'Rockin' the Suburbs' book) or a full score (like the respected 'Whatever and Ever Amen' book). Sadly, it's the former. A closer look in the top-right corner of the amazon image shows only piano and vocal. Hopefully they'll keep the two seperate. Of course, there's always the fan transcriptions and sheet music. Thanks to the eagle-eyed Martino and Jobo for the info!